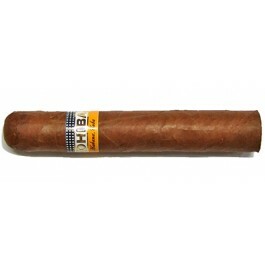 The Cohiba Robustos is a Cuban classic, rich and strong, 50 ring gauge, 4.9” (124mm) long and comes in an elegant varnished wooden box of 25 cigars. One of Habanos best sellers. Thanks to its near perfect construction and flavors, it is the benchmark for all other robustos. A must-try for any cigar aficionado. 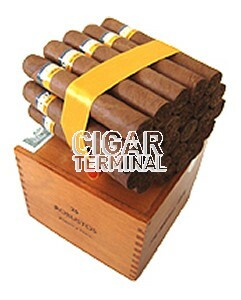 •	Both a work of art and a delight to the palate. .
Like every Cohiba, the Robusto is a beautiful cigar. It has a light tan colored, oily wrapper and some very smooth veins. The bunch is solid and the triple cap is flat and well applied. Into the second third the cigar becomes more complex exhibiting wood, caramel, honey and cedar. It has plenty of earth and wood, all perfectly balanced in great harmony. In summary, consistent with a great draw and burn, smokes for about 60 minutes growing in strength starting off medium ending beautifully with full creaminess and rich great strength with a clean aftertaste on the palate.